This year, the plunges raised money to help victims of Superstorm Sandy as well as other local charities. The hundreds of participants in this year’s Polar Bear Plunges weren’t just dipping into the bone-chilling surf to seek some thrills. They were also doing it for a good cause. 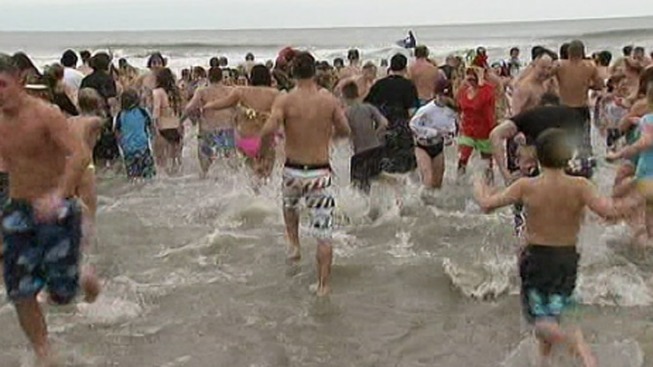 The annual New Year’s Day event features brave souls stepping into the cold waters of several Jersey Shore beaches. This year, the plunges raised money to help victims of Superstorm Sandy as well as other local charities. Members of the Wish Upon a Hero Foundation ran into the surf in Ocean City. The group has provided assistance to South Jersey victims of Sandy. “They sent us clothes within a few days and made sure we got back on our feet,” said Ken Murphy, a Superstorm Sandy victim. Many local residents took part in a New Year s Day tradition today. They hit the beaches in the Jersey Shore for the annual polar bear plunges. NBC10 s Ted Greenberg has the details. In Atlantic City, close to 200 people sprinted into the water to help the AC Polar Bear Club raise more than $2,000 for the Multiple Sclerosis Association of America. Now in its 13th year, Brigantine’s Polar Bear Club supports Fisher House, which provides transportation and housing to the families of wounded military members. Many people in Brigantine were directly impacted by Sandy. The location for this year’s plunge in Brigantine had to be changed since the beach where they normally held the event doesn’t exist anymore due to Sandy. “From this storm, there’s no seawall left,” said Hand. But the thrills and chills remained the same in the new location, providing a fun-filled kickoff to 2013 and hope for better things to come this year.